In March 2014, human rights lawyer, Thulani Maseko, and magazine editor, Bheki Makhubu, were arrested and charged with contempt of court. The Nation and its publisher were also charged. Maseko and Makhubu had both written articles in Makhubu’s magazine, The Nation, in which they criticised the Swazi judiciary and the Chief Justice. Despite various applications for their release and the recusal of the presiding judge, in July 2014 Judge Mpendulo Simelane found the pair guilty of contempt and sentenced them to a two-year jail term without the option of a fine. Maseko was represented by Adv Martin Brassey SC and Adv Khotso Ramolefe, and Makhubu was represented by Adv Lucas Maziya. The matter was heard by Eprahim, Moore, and Levinsohn JJA. On 3 December 2014, the Supreme Court delivered an oral judgment, finding in favour of the Chief Justice and holding that Maseko and Makhubu’s arrest and detention were lawful. No written judgment has been provided by the Supreme Court. The appeal brought by Maseko and Makhubu against their conviction and sentence was due to be heard in May 2015, but the sitting of the Supreme Court was postponed. Maseko was represented by Mandla Mkhwanazi, and Makhubu, The Nation and its publisher were represented by Adv Anna-Marie de Vos SC and Ncamiso Manana. On 30 June 2015, the Supreme Court was convened to hear oral arguments in the appeal. The matter was heard by Odoki, Annandale and Mamba JJA. 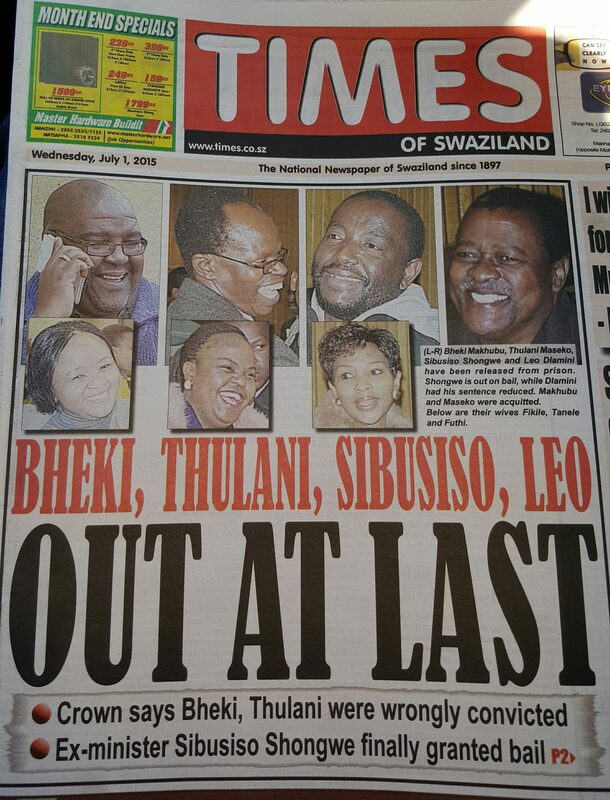 In Court, the Crown conceded that Maseko and Makhubu’s convictions were unsupportable. The Supreme Court upheld the appeal and ordered Maseko and Makhubu’s immediate release.